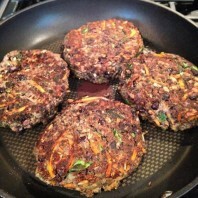 These “Simply Made Black Bean Burgers” are so good, you won’t even miss the meat!! Place all the ingredients into a food processor ( except for 1 cup of the black beans, 1 cup carrots, and the sunflower seeds) and process until well combined. Transfer mixture to a large bowl and stir in the remaining beans, carrots, and sunflower seeds. Heat a Tbsp or two of olive oil in a frying pan over medium-low heat. With clean hands, form the bean mixture into 8 patties. Place the patties in the pan and cook until both sides are golden brown. Serve on a whole grain bun topped with a slice of avocado and cheese (optional).